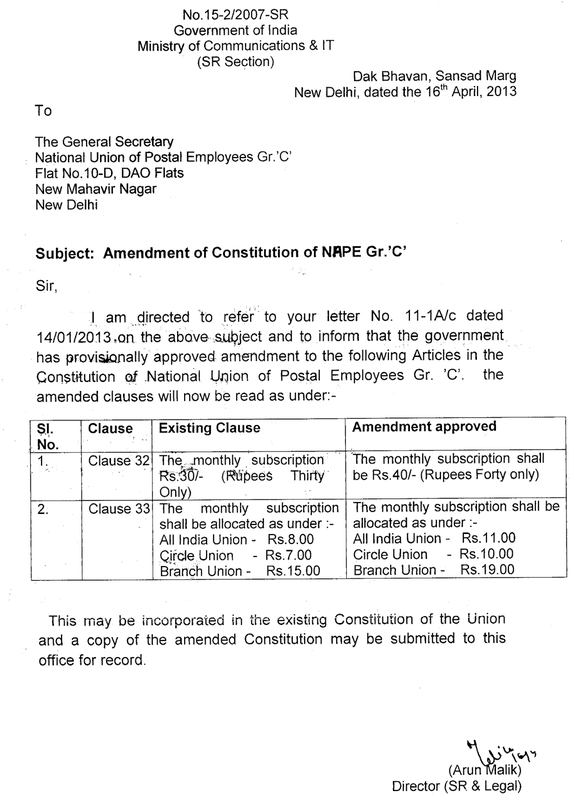 2014-07-13 ~ National Association of Postal Employees, Tirunelveli Division. Workshop on roll-out of Core Insurance Solution and creation of Central Processing Centre of PLI/RPLI held in the Directorate of PLI, New Delhi at 10-00 hrs on 17-07-2014. On behalf of FNPO Association Secretary General, Sri D Theagarajan nominated AIPAOA, DPLI Kolkata representatives to attend the above mentioned workshop. The presentation on the roll-out of CIS and creation of CPCs was given by the CGM(PLI), GM(PLI) and AGM(PLI). Representatives of FNPO welcomed the roll-out plan of the department for extending the benefit of PLI/RPLI business at the doorstep of customers. FNPO representatives emphasised on incorporating provisions for correct accounting of PLI/RPLI business in the ongoing process of modernization. Representatives of FNPO, on behalf of SGFNPO Sri D Theagarajan, conveyed their heartfelt regards to the CGM(PLI) for handing over the net-accretion work to DPLI, KOLKATA OFFICE. 1. New role of DPLI, Kolkata as the Central Accounting Office. 2. Online procedural auditing of documents like paid-vouchers, loan payment vouchers, etc. 3. Setting up of national/regional Training Centre along with R&D Cell in DPLI, Kolkata office. 4. Strengthening the Actuarial functioning by Actuarial section of DPLI, Kolkata office for correct reflection of accounts. 5. Up gradation of DPLI Kolkata office to SAG level and creation of additional posts of CAO/Dy.Director for handling the high profile revenue earning work of net-accretion. 6. To facilitate net-accretion work effectively provide high-speed SIFFY internet connection to DPLI, Kolkata. The concerned authority has assured the FNPO representatives that the above matters would be taken into consideration. No proposal to raise the age of retirement of central government employees – Central Government. கடந்த ஏப்ரல் 2013 முதல் நமது தேசிய சங்க மூன்றாம் பிரிவின் மாத சந்தாதொகை ரூபாய் 30 லிருந்து 40 ஆக மாற்றிய இலாகாவின் அதிகாரபூர்வ உத்தரவிற்கு (No. 12-2/2007-SR Dated 16th April 2013) பிறகும் இன்னும் பல கோட்டங்களில் புதிய சந்தாவை பிடித்தம் செய்யாமல் பழைய சந்தாவே (ரூபாய் 30) தொடர்வதாக தெரிகிறது . எனவே பல்வேறு கோட்ட செயலர்களின் வேண்டுகோளினை தொடர்ந்து இலாகாவின் உத்தரவினை இதோ உங்களுக்காக தருகிறோம். இதன் நகலை காப்பி எடுத்து உங்கள் கோட்டகண்காணிப்பாளரிடம் கொடுத்து அதற்கான உத்ததரவினை பெற்றுக்கொள்ளுமாறு அன்புடன் வேண்டுகிறோம். An important meeting of the central JCA will be held on 28th July 2014 Monday at 2 pm at NFPE office New Delhi to chalk out agitation programs on pending demands. All general secretaries are requested to attend the meeting in time. 2. PLI Roll out & Creation CPCs at HPO level-- Work shop. திரு சொர்ணம் அவர்கள் பணி சிறக்க வாழ்த்தி வரவேற்கிறோம். 1)Prime Minister Narendra Modi has asked for an exhaustive Central database of all Central and state government employees﻿. 2)Cut-off eligibility date for promotion and calculation of vacancies including chain vacancies – reg. 3) Distance limit on issuing a Tatkal ticket .﻿.